Numismatic is defined as "the study and/or collecting of rare coins, medals, and related objects." Generic Numismatics refer to the most popular common-date investment- grade coins, such as the $20.00 Liberty and $20.00 St. Gaudens gold coins and famous Morgan Silver Dollars. For more on these see below. Investment-grade coins (graded Mint-State 62 and above) are traded daily worldwide based on their scarcity, independently certified condition and market demand, thus meeting all of the qualifications for both investors and collectors. Numismatic coins are 100% private and considered one of the few "non-reportable" assets remaining. Today aware people realize the urgent need for hard asset protection and diversification of their financial portfolio in the midst of our constantly changing economic environment. Numismatic gold coins offer unique qualities that provide balanced and tangible hard currency protection. Most people want to know: "Which is the best way to own gold?" The answer: Numismatic twenty-dollar gold pieces. 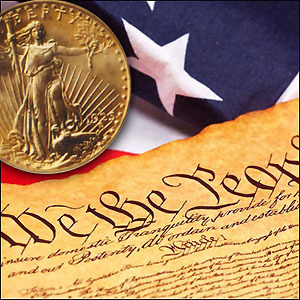 $20 gold coins offer: protection, privacy and profit potential superior to other forms of gold. Gold and silver coinage has been used as a medium of exchange and a store of value throughout recorded history. From Abraham in the Old Testament to your grandfather, they all understood that gold and silver coins are "real money". Perhaps that is why America’s Founding Fathers designated gold and silver coins as the only "tender in payment of debts” in Article 1 Sec. 10 of the U. S. Constitution. Gold coins were removed from general circulation in the U. S. upon Franklin D. Roosevelt’s issue of the Presidential Executive Order of 1933. Under this order all circulated gold coins and gold bullion had to be surrendered to the Federal Reserve Bank. Thankfully, a precious few gold coins did survive the melting pot to find a new home in Europe. Since 1975, when gold ownership once again became legal, many of these $20 gold coins have been returned to the U. S. where they’ve experienced great popularity and profitability. 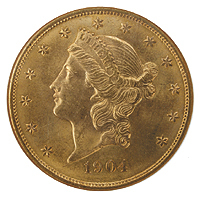 The gold coins used for general circulation were approximately one ounce and had a twenty-dollar face value. The $20 face value was based on the gold weight and purity. 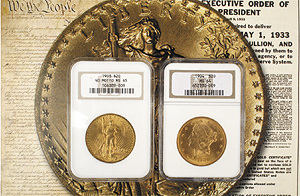 There are two issues of $20 gold coins: the Liberty and the Saint Gaudens. The first issue, referred to as the $20 Liberty, was authorized by Congress on March 3, 1849 and was designed by John B. Longacre. 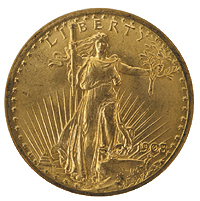 The Liberty was minted from 1850 to 1907. The second issue, referred to as the Saint Gaudens, was designed by the famous sculptor Augustus St. Gaudens and was minted from 1907 to 1933. All $20 gold coins and other currency coins were discontinued in 1933 when gold ownership was outlawed. Today, uncirculated or "Mint-State" gold coins are considered numismatic and have collectible status if they have a recognized special value to collectors of rare and unusual coins. This numismatic value is critical to maintaining privacy and protection against possible future government confiscation. Bullion coins that are valued only for their metal content do not qualify as numismatics. How Can I Benefit From Owning $20 Gold? Twenty-dollar gold pieces are wealth preservers that you physically hold. By owning a hard asset, you control your financial destiny. Ask yourself, if you were aboard a sinking ship, would you rather have a life preserver or a life preserver certificate? Gold is real money. Finding assets that offer privacy today can be a daunting task. Twenty-dollar gold pieces are a haven for those who value the benefits of asset privacy. Their status as a collectible at present allows for the purchase and sale without the 1099-B reporting required by the IRS for their bullion counterpart. Numismatic coins are excluded from FDR’s Presidential Executive Order 6102, Section 2B of 1933. Collectible gold has performed well over the years due to an ever-increasing demand and limited supply. As a result of the 1979-1980 gold rush, twenty-dollar gold coins, in particular, have seen impressive increases in value. 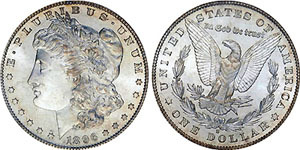 U.S. numismatic coins have been one of the top non-leveraged performers in the past, even during difficult economic periods. Coin certification adds to liquidity and eliminates uncertainty when purchasing and selling. Because gold is "universal money", there are thousands of locations to liquidate certified coins. Cashing out doesn't take weeks as it may take with stocks. Which type of silver is best to own? Silver prices rose 83% in 2010! In 2009 silver prices rose 50%! That's 133% growth in 2 years. Given that silver prices may rise dramatically in the years ahead, which type of silver is best for the average investor to own? Should you buy 1-oz. Silver Eagle coins or 100-ounce silver bullion bricks? How about Wall Street's latest invention, silver ETFs? How about historic U.S. Morgan Silver Dollars? Morgan Dollars are highly sought after by coin collectors, traders and investors alike because of their beauty, history and easy storage. Generic Numismatic coins are affected by the precious metals market. Unlike true rare coins, these coins have a premium that is dependent on supply and demand. They have a finite (meaning fixed) supply as gold demand surges and supply is low, premiums on generic numismatic coins can spike dramatically. Conversely if demand is low prices will decline. Knowledge of the gold price trends for timing both in the long and short term will indicate when to get into generic numismatics and when to sell. As with any investment there is risk associated with generic numismatics however significant gains can be achieved with positive financial return.